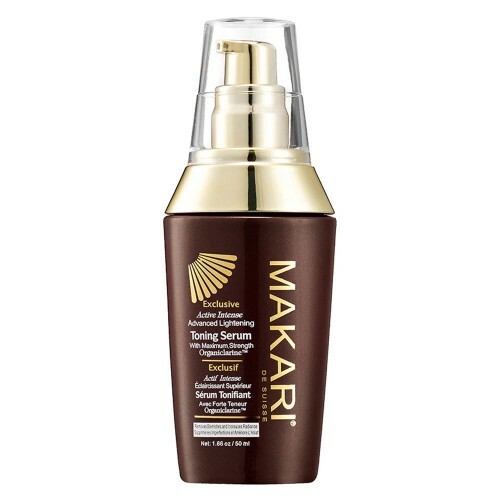 Lighten the discolored areas of your skin with Makari Toning Serum. Its advance lightening formula is enriched with plant extracts such as Organiclarine, which effectively helps your hyper pigmentation to fade over time, giving you a more radiant complexion to boost your confidence. This serum will definitely give you the most effective skin toning results whilst maintaining the quality of your skin. The chemical-free formula leaves no room for safety issues, making Makari Toning Serum ideal for the most delicate of skin types. Use this body serum regularly just twice a week and get amazing skin with clear, bright and even skin tone. What is Makari Toning Serum? Makari Toning Serum is a complete skin lightening solution that needs to be applied to your dark spots only. It is formulated with Organiclarine, an all-natural plant extracts and properties from the sea that are soothing for your skin. With this natural advanced lightening formula, this serum effectively fights discoloration, dark spots, and uneven skin tones on your body to give you a nourished, lightened and uniform skin tone. What are the ingredients of this body Skin toning Serum? The ingredients of Makari Toning Serum include Aqua (Water), Propylen Glycol, Carbomer, Glycerin, Sodium Lactate, Organiclarine, Licorice (Glycyrrhiza Glabra) Extract, Mulberry (Morus Alba) Root Extract, Citrus Limonum, Arbutin, Retinyl Palmitate, Phenoxyethanol, Parfum (Fragrance), Citrus Acid, Allantoin, Ascorbic Acid, Sodium Sulfite, Disodium EDTA, A-Isomethylionone, Benzyle Alcohol, Benzyl Salicylate, Citronellol, Coumarin, Geraniol, Limonene and Linalool. Makari uses a naturally based skin lightening substance called Organiclarine in all its products. This makes the Makari Toning Serum so gentle and soothing while effectively fighting the hyper pigmentation issues of your skin. This property of Organiclarine allows the toning serum to be used on even the most delicate skin. And within a few weeks of use you will find your dark spots fade and leave you with beautiful, youthful and radiant skin. Unlike other serums and skin lightening products, Makari Toning Serum is made for only those areas that need to be treated. Just follow this easy guide while implementing it into your weekly skin care regime to get a clear, bright, and even skin tone. Every skin type reacts differently to natural treatments. Makari Toning Serum can show visible improvements and lasting results with regular and correct use. It is recommended that you use this excellent Body Toning Serum for at least 30 days to reflect its full benefits on your body. How can I order my Makari Toning Serum? Purchasing your own Makari Toning Serum from SkinCareTotal is simple, secure and convenient. Simply click the “Add to Basket” option and choose from a range of payment options. And if you place an order by 4:30pm on any working day, you can begin your journey for an evenly toned body the very next day.